Team Zombillies reviewed this attraction on October 14, 2017. Deep within the seemingly desolate woods of Lockport, Illinois is a trail. A trail overrun by swift, flesh-eating zombies and unexplainable creatures. But this isn’t an ordinary trail at all. It’s the beginning of something amazing. The rumors are true! IF you are daring and fast-footed enough to escape the heathens along this wooded path, this trail will lead you onward to a haunted house where you can get your money back, and yes… it even has secret passageways and a slide that’ll send you plummeting into the basement, but that is FAR from all that it has. If you manage to stumble upon this beautiful, haunted-looking mansion, don’t let its awe-inspiring looks fool you, for within these walls are some of the most demonic entities we have ever encountered. Inside, “the darkness” has taken over and the Captain has opened a gate… Hell’s gate. Its malevolence has covered the walls, the attic, the basement… it’s everywhere and, once you enter the property, there’s no hiding from it anymore. 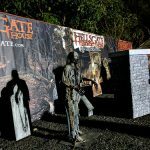 HellsGate’s cast is spawned from Zombie Army Productions, the same source as those who inhabit the nearby Statesville Haunted Prison. You’ll likely see many of their same traits, tactics and techniques used here too because… well… if it ain’t broke, don’t fix it. These characters are the best we’ve ever seen when it comes to staying in character and delivering believable performances. Each and every one of them serve a clear purpose and it would almost be detrimental to say that “the characters fulfilled their roles.” In fact, the people and creatures you’ll see aren’t really characters anymore… they are who they’ve become. No amount of interaction (short of breaking a rule) will cause them to break and, not only can the ones with speaking roles improv quite nicely, they can roll with it and keep spiraling into a whole other sub-story (if time allows). One of the best examples of this was after the trail on the front porch of the mansion. A swarm of the manor’s residents had swarmed our group to try and save us from the monsters on the front lawn and started asking if any of us had been bitten. One of our group members said, “Just a little bit,” which REALLY caught their attention and they immediately asked, “Where? !” with an immediate sense of intense desperation. When our group member revealed a dime-sized scar on his forearm, they started explaining that “The darkness is inside you!” and how they would have to cut off his arm just above the elbow to keep it from spreading. Now, they could’ve just left it at that. But instead, they got in position to do what they said with a valiant, two-handed karate chop and our group member braced for an imminent amputation! (Don’t worry, he’s still got all of his arm.) The point is, they each know their roles very well and are dedicated to the suspension of disbelief. Some of the creatures and zombies in the woods made some rather interesting noises. Instead of sticking with generic screaming or growling, the best way we can think to describe it is something between a shrill cry and a velociraptor. You’ll know when you hear it. These zombies are fast, too… like “World War Z” zombies. Their hastiness must have something to do with “the darkness” because a couple of them waited ahead of us on the trail and ran after us in what ended up being an apocalyptic game of “chicken.” In addition, a nearby grave keeper told us how he’d been trying to bury the zombies and “…they just keep coming back!” Once we entered the gates to the mansion, a clown that was seemingly paralyzed from the waist down came crawling towards us by only using his arms and dragging his legs behind him. In combination with the look on his face and incomprehensible laughter, we couldn’t help but agree that he looked like an ecstatic dog whose family had just returned home from a week-long vacation. 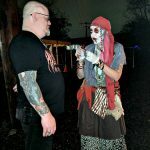 If you’re afraid of clowns, there are a few in that area that you probably aren’t going to enjoy crossing paths with… but we found it to be absolutely hilarious! We also have to mention the ghillie suit guy with the voice changer for getting us multiple times and one of the twin girls that produced debatably the most demonic sound we’ve ever heard in real life as we made our way through her bedroom (and appropriately so). Apparently, she wasn’t very happy about us being there. Closer to the house, one of the manor’s residents informed us that “The captain is waiting for [us]” while others were scrambling around, trying to keep “the darkness” inside, which was made evident by the front door trying to slam open while they held it back with the full weight of their bodies. When the beating subsided, we made our way to the first room inside and another one questioned our intellectual integrity for choosing to seek shelter there from the creatures outside. We started to agree when we saw possessed people start literally climbing the walls and flying overhead! It’s a rare find to discover a haunt with hyper-realistic actors and costumes that match their authenticity. 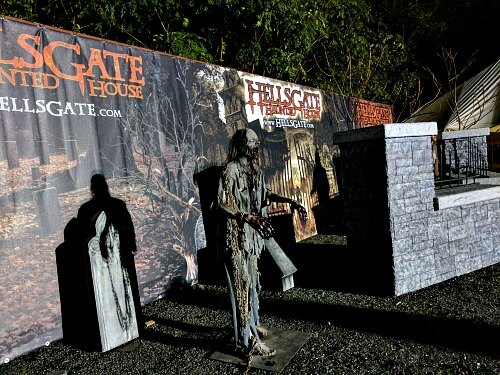 You’ll find a wide variety of characters, both on the trail and inside the house, and HellsGate spares no expense to make sure each of them look as realistic and believable as possible. The creatures we saw were covered from head to toe, zombies were distressed with dirty and tattered attire, grave keepers and manor residents wore formal, vintage clothing that matched the mansion they called home (white shirts, vests, top hats, black pants, etc. ), the twins were identically decorated and each of the other characters had their own unique adornments that helped us understand who they were. Masks are used sporadically throughout the haunt and tended to be of very high quality. Ranging from plague masks to those of the animal variety (pigs, moles, cats, etc. ), each of them are used well and none of them come across as a cheap way to cover their faces. Makeup is typically applied with airbrushes for smooth and natural, yet detailed result that further enhanced the characters not wearing masks. There isn’t an overuse of blood here either, mainly because the theme revolves pretty heavily on the spread of “the darkness.” So, instead of using the common crimson color, most of the bodily fluid eruptions were black in appearance (as far as costuming goes). There are a few that don’t use hardly any makeup or masks (mainly the manor residents), but their characters don’t really call for it. They aren’t injured or possessed, so they’re actually intended to look as lifelike and “normal” as possible (with consideration for their vintage attire). 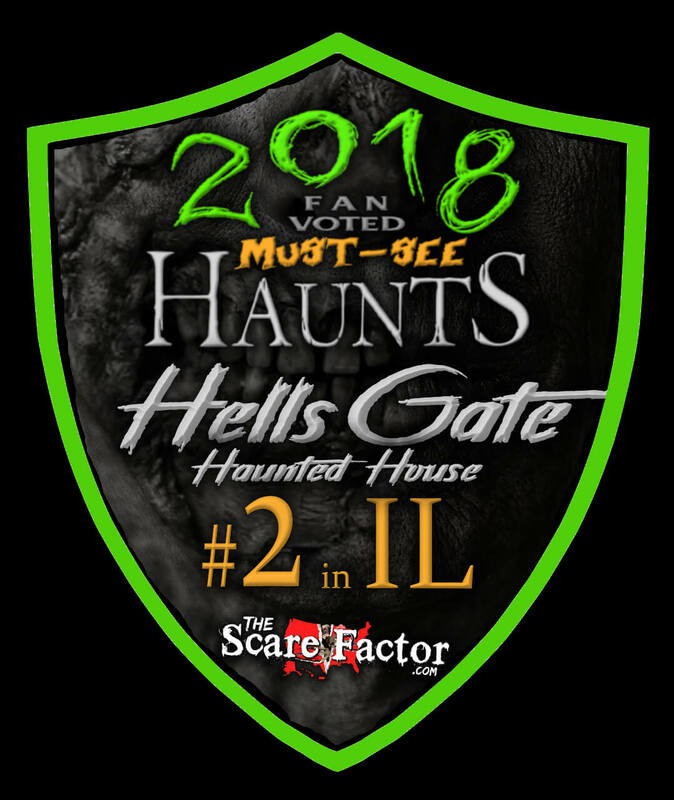 HellsGate is hidden deep within the woods, so no customer parking is available at the haunt’s actual location. Instead, all patrons must park at the Lockport Metra Station (a nearby train stop) and take a 5-minute shuttle bus ride to HellsGate. The lot is free to use, paved, very well lit and portable restrooms are available, but the only real sign you’ll see that’ll let you know you’re at the right place are the yellow school busses and a few “no alcohol” a-frame signs on the sidewalks (aside from a fellow or two in “HellsGate” shirts). We arrived at 6:15, so we suppose there’s a chance we could’ve missed something, but the first bus was already almost halfway full, so we advise showing up as early as possible. Finding your way around the property is fairly simple and the ticket booth was very obvious, as that’s where the busses will drop you off at. There was also a great photo op on the way to get in line. Each of the staff were very professional, easy to find, helpful and friendly… just in case you should need any assistance or to ask questions. While we waited, multiple creatures and beings came out to play with us. They were all well-versed, seemingly happy to see us and played a big part in helping us pass the time… along with the Rob Zombie music that was playing in the tent. If you haven’t been here before, or are familiar with how the lines work at Zombie Army’s other attraction (Statesville Haunted Prison), you’ll find that crowds are often handled in batches and then split into groups for each leg of the tour. 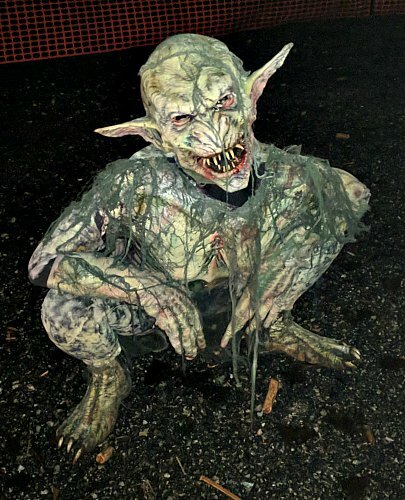 You’ll be told to line up into multiple single-file lines and instructed on when it’s your group’s turn to start the next phase of the haunt. This helps with keeping the groups separated throughout the experience, as well as getting the rules and other information (such as the theme) across to a large amount of people at one time. 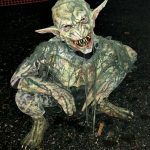 It should also be known that, if you arrive on a rainy night (like we did), the waiting line at the train station is only slightly covered from weather, so it might be wise to bring rain gear in case the line is long and all of the busses are out travelling to and from the haunt. When you get to the haunt, the line for the ticket booth is also uncovered, but the first actual queue line is under a very large tent. 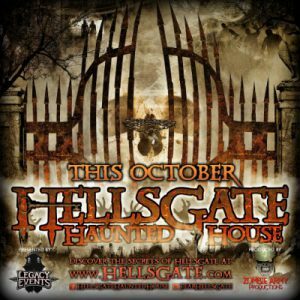 HellsGate’s graveyard/trail may close in the event of bad weather because, of course, it’s outside and, once you get to the house, you may be staged outside the front door for a brief time too. Though, we did see a small shelter positioned to the side of the house, so groups that get caught in the rain while out on the trail may be staged over there or under the mansion’s lower roof in the event of a sudden downpour. However, the rest of the house is indoors and will continue to operate, rain or shine.The trail is mostly mulched, so mud and uneven ground isn’t much of an issue, but appropriate footwear and being mindful of where you’re walking is always recommended. If for some reason you skipped down to this category and didn’t read anything above it, the “atmosphere” starts before you even arrive at the haunt. For starters, you will not drive to the haunt itself at first. You will arrive at a train station and board school buses that will take you down a winding road out in the middle of nowhere. Yes, you are taken and dropped off and the only way to get back to your car is by bus, which could be pretty creepy to some people. We missed not having a sound track playing on the bus this year, but as we neared the attraction, curious bus riders started looking out the windows on both sides, trying to find some sort of sign that we were getting close to the mansion. Once we were dropped off at the ticket booth, it was STILL hidden! (Well… for the most part. It’s hard to miss all of the lights that illuminate the mansion’s beautiful exterior, but we still couldn’t completely make it out until after we made it to the end of trail). They said it would be hidden, but rarely do we discover a place with a layout that actually keeps the main attraction’s building hidden from plain sight like this! While we waited to enter the trail, a Rob Zombie track met our ears and that’s when the excitement really started to ramp up for us. The multiple queue line entertainers also increased our readiness to enter and they were a nice teaser for what we encountered inside the haunt. From the queue area, the intended focal point is the entrance to the trail, which is a bit different this season. As soon as we set eyes on the towering “Doom” character that was guarding the entrance, we were pretty much ready to turn around! He didn’t say anything though, he just stood and stared at us with an emotionless glare while watching our every move. A large, boney archway and fire pit marked the entrance to the trail and, as it turned out, it was only the beginning of many more skeletal remains that we would soon find. The best part of the atmosphere is the break between the trail and the house. This is where the breathtaking appearance of the mansion really sets in! But don’t stare for too long. Along with colored accent lights and spooky sounds, there are many roaming monsters to greet you when the gates start to creak open. We classify a “special effect” as anything that uses your senses to create an alternate reality (not including actors). Scene design and details, decorations, props, lights, animatronics and pretty much everything in between that you can see, hear, touch, taste or smell. This is one of the key aspects of establishing “the suspension of disbelief,” which means making you believe that something is real when it actually might not be. HellsGate has got this down to a science and pummels you with movie-quality scenes and special effects from start to finish! But, some of the things you’ll see may seem just a tad bit random if you don’t read the haunt’s backstory before you go through (discussed below under “Theme”). When you walk up to the entrance of the trail and the first things you see is a fire pit and a tribal, log archway that’s covered with real animal bones (Yes, they’re real. We confirmed it), you know you’re going to be in for a treat! Similar skeletal remains lined the path of the trail through the graveyard and served as a constant reminder that death was all around us. 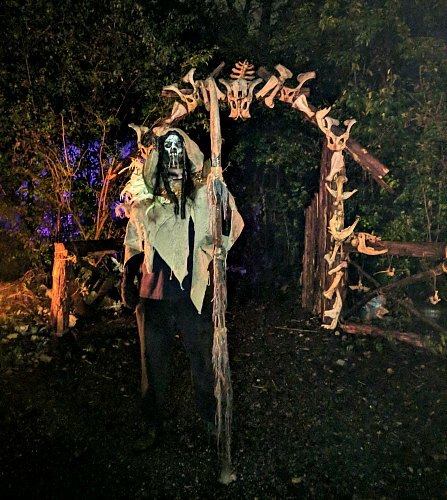 Large, pumpkin-headed statues, other tribal symbols, a sacrificial scene, tunnels that led us through swamps and bee-infested nests, tombstones, a tool shed, extremely-thick fog and large, natural rock formations are just some of the things that are waiting for you as you start your trek toward the mansion. 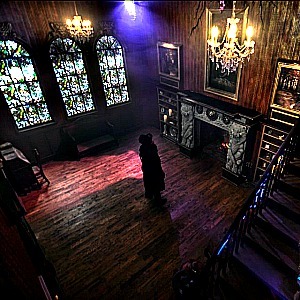 Dim, various-colored lights are in place to keep things nice and dark while adding spookiness and emphasis to the most important parts of the scenes. We can’t say enough about the mansion’s facade! We had the privilege of touring the balcony last year and discovered that… yes, the wood siding is actually real wood, the shingles are real, the windows are real… this thing is legit! (Just don’t look at the rest of the building. After all, it is a “facade.”). 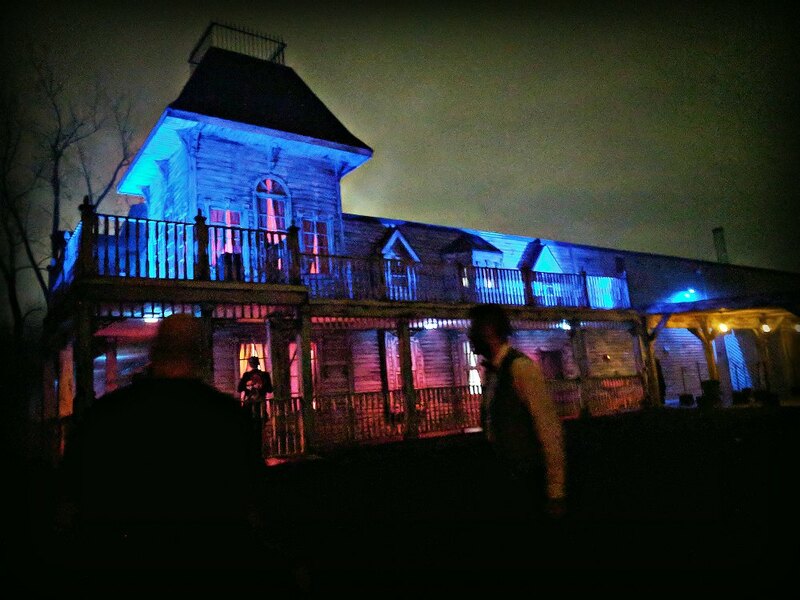 The sounds and lights that accompany the majestic mansion casted an eerie glow and provided an intensifying sense of urgency and desperation as we walked through the gates and up to the front door. Competing with the building’s exterior is their introduction room. This is where the theme’s story is unveiled to the cracks of lightning and thunder through massive, stained-glass windows (whether it’s raining outside or not). Wooden floors, a tall ceiling, flickering lights, thrilling orchestral music and a few “misleading” wall paintings made for some interesting surprises, along with a gravity-defying feat that was accomplished by one of the twins. We could probably go on for days talking about the theme-related scenes and level of detail we found inside the house. 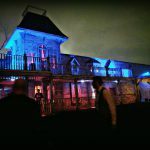 But, to sum it up in short, the best way to describe it is like a miniature Disneyland for haunted house lovers! From textured wallpaper, slatted holes in the walls, secret passages and flickering candles to their new, massive, mad-scientist experimental control room, everything we saw looked and sounded immaculate. 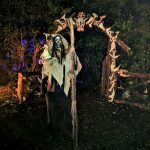 Be prepared for strobes, fog, lasers, intense music animatronics, dead bodies, life-like dolls and a massive, hellish creature, should you decide you’d like to face the darkness head-to-head this year! The only thing we could ask for (except for more!) would be to not be rushed so much going through. There’s so much to see and so little time to see it! But, the urgency has its place and we suppose that, when you’re trying to accommodate a huge crowd every night, you win some and you lose some. 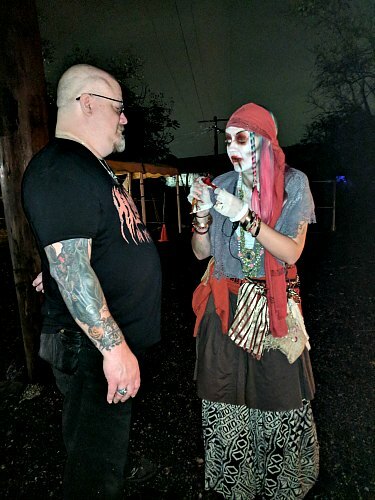 There is a lot of history behind Hellsgate Haunted House that wraps around The Captain (a retired army medic), his obsession with bringing his daughters back to life and, thus, “the darkness” that was released as a result. Information on some of the key characters here can be found on their website and it’s actually an interesting read, so we recommend checking it out to get the full experience. Hellsgate embraces even the finest details of the characters’ backgrounds all the way down to why the clowns are there and why you may come across a beehive while in the woods. The characters reiterated bits and pieces of the history and, all together, this theme was brought to life right before our very own eyes! As we were waiting our turn to enter the mansion, those outside were forcefully trying to keep the doors shut as they said the aforementioned “darkness” was trying to escape! With complete disregard for their valiant efforts to contain the demonic element, we stupidly entered this hellish nightmare and faced one of the most mesmeric and exciting theme introductions we’ve seen to date! The twins were well alive (sort of) and standing high above us on the fireplace mantle as they welcomed us to the evil souls and sorcerers of the damned that The Captain had foolishly allowed to enter this abode. First off, just as we were told, don’t trust anything! “The children are not children and the toys are not toys!” Heck we wouldn’t even trust the furniture! The scares at HellsGate were definitely more plentiful this year and, at times, they produced what we call “360 scare zones.” This is when the scares come at your from above and below, from next to you and, sometimes, from behind or in front of you, making it extremely hard to predict when the next one will strike. They were also directed at everyone in our group, not at just the front or back of the line and not just for the females. Much like the trail, visitors can expect lots of new frights once they are inside the mansion. From tight and compact spaces, spiteful stares and great hiding spots to skin-shrinking sounds of demons, a few common fears and more, the ante for screams has been raised this season! Around seemingly every corner, there’s something that lies waiting to scare the crap out of you. Even the basement had us on high alert the entire time we made our way around the new lab equipment and experiments this year. The actors inside were very relentless in their efforts to catch us off-guard as they popped out at us from various angles and places we never thought something could come from. A few of the effects actually delivered surprises all on their own too, which is something we don’t see very often. General admission to walk the paths and enter the Gate will cost you $28.00 per person. VIP access is available, giving guests a shorter wait in line for $40.00. If you are one who just absolutely doesn’t want to wait in line practically at all, they’ve got you covered too with their $60.00 instant entry ticket option! Some prices are up a bit from last season, but the many changes and length addition we captured make the increase worth it. With that being said, our journey along the trail took us around 11 minutes and we were trapped within the darkness for another 22-1/2, including the time we spent interacting with those outside the mansion. When considering the general admission price, that gives HellsGate a MPD (minutes of entertainment per dollar spent) of 1.2. Although, this is a bit lower than the average 1.5 that we see most often, the endless, effective encounters that we experienced make this show well worth the price! 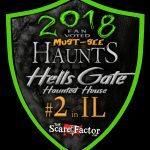 HellsGate offers additional ticketing options as well, from an All Access Pass, 12 Person Group Package, a Ghost Hunter Pass, a “Hell Pass” and more! Details for each can be found on their website. Oh yes! Don’t forget… “If you find the key, your ticket is free!” It’s true… but not everyone is guaranteed to find it. The only clues we can give you are that “it’s not just any key” and instructions will be given to you just before it’s time to start looking. Good luck! 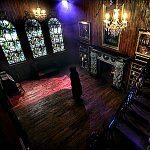 If you are looking for a slaughterhouse-type haunt with a lot of blood, guts and gore, you won’t find that here. 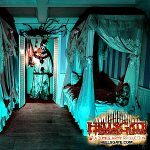 But, if you’re in the market for an interactive, dramatic and theatrical exploit that tells a story as you walk through, then HellsGate is the house for you! The acting was so continuous that it left us with little space to even make comments to one another! There was just so much going on and so many things coming at us from all directions that we felt as if we were trapped within the latest and greatest movie… only, in this movie, you don’t get a ‘pause’ or ‘stop’ button if the darkness consumes you!